Like her smaller and larger sisters in the ever expanding product line, the Marlow Explorer58E exhibits comparatively huge volumes of space compared to typical polyester and woven roving construction with inferior plywood bulkheads and wood framed bilges. By eliminating wooden supports, bulkheads and framing in favor of resin infused composite construction we have once again been able to bring a yacht to market with 79" of headroom in the main salon and lower accommodations areas, 74" in the engine room and a total height to the top of the hardtop of just 18'2". This low profile make a far superior sea boat with a drastically lowered center of gravity, while allowing the yacht to slip under many bridges an ordinary yacht in this size range would have to wait for. The proprietary and protected VelocijetStrut Keels® are used to great success allowing propeller protection and down sea tracking that has the industries' experts raving. Like feathers on an arrow, these twin tails guide and stabilize the yacht making heavy downwind running a delight rather than a white knuckle experience. Custom built epoxy fiberglass tanks, fiberglass fuel tanks (no corrosion) and the finest fittings available from the premier suppliers around the globe, the58E will be, like her sisters, a yacht for the ages. Old world craftsmanship blended with modern space age components and technology. Yachting will never be the same. United Yacht Sales New Jersey would love to guide you through a personal showing of this 58' Marlow 58e 2015. 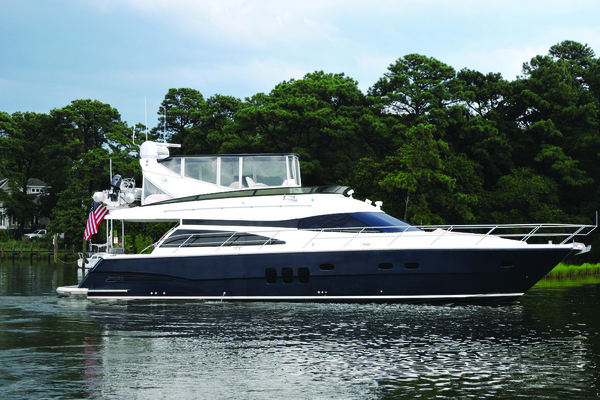 This yacht for sale is located in Jacksonville, Florida and priced at $2,150,000. For a showing please contact us by filling out the form on this page and we will get back to you shortly! The owner of "Bet-A Buc" and the family have enjoyed cruising in their new Marlow Explorer over the last 2 years. This knowledgeable yachtsman has owned many fine boats over 5 decades and reports that this is the most quiet and comfortable Yacht they have ever owned. She is comfortable at 8-10 knots with trawler like efficiency but will cruise at 21-22 knots whenever you want to get there quickly. The Marlow Explorer is one of a few yachts in the world that provide the ability to function very efficiently at either speed. This 58E has a custom layout that provides a full beam center line Master stateroom with his and hers heads, a queen VIP with a very large guest head. The crew cabin is great for a captain or mate and I am sure some older grand children will be very happy with the space as well. The crew cabin and engine room are accessed via a private entrance on the aft deck. This raised deck pilothouse lower helm area has been replaced with a large seating area making the yacht feel much larger than a 58. The upper helm is fully enclosed eliminating the need for the lower station. With wide side decks, a cockpit station and wireless Yacht Controllera couplewill be able to dock her with ease. The salon is open to the Galley and seating area providing a clear view from the aft salon doors to the front windows giving you a great sense of space. There is plenty of outdoor space with a large cockpit seat and table that will seat 6 with the addition of 3 chairs. Behind the command bridge on the upper deck the seating and table is duplicated with room for 6. She has a full beam Master Stateroom with His and Hers heads and a VIP with a large head. This is the perfect yacht for 2 couples. There is a nice crew cabin aft when you want to take a mate with you. As you go below the full size washer and dryer are on the starboard side with a nice bunk / folding area above. Bet-A Buc has a rich warm Cherry Interior with traditional solid Teak and Holly floors. The galley is stunning with her custom granite counter tops, Franke stainless sink, and gold single lever faucet. There is a full size 4 burner Décor cooktop, full size Décor oven and Sharp microwave. There are 2 Sub Zero refrigerator drawers and 2 sub zero freezer drawers. There is a Fisher Paykel dishwasher. The pilothouse table is satin Cherry with a bull nose edge. The settee is a large U shape covered in beautiful cashmere ultraleather. This is a nice table for 6. There is a large cabinet on the port side with a granite top. The current owner used this as a coffee station so nobody had to go into the galley to get coffee. This is a very open feeling space with views in all directions. The interior of the Master stateroom is finished in beautiful satin Cherry. The led lights are on dimmers. The Master stateroom is a center line King with nightstands and storage drawers on either side. The heads are accessed by port and starboard doors and each side has a toilet and sink area with light Cream of Marphil counter tops. There are beveled mirrors in the inside of the port and starboard head doors. In the stateroom there are hanging lockers and storage drawers on each side thatare plenty for cruising. The large TV is on the forward Port side. On the port side there is a comfortable vanity and seat, the perfect spot for getting ready for your day. The Engine Room is beautiful. The bilges are bright white. The space is well lit. Four 24Volt DC fans circulate air in and out. The 1500 Gallon fuel tank is in the forward bulkhead. The tank is custom built with epoxy fiberglass and is shaped to use all possible space maximizing capacity. There is a spring loaded Bronze shutoff valve that can be closed from the side deck in an emergency. All fuel supply lines are stainless steel wherever possible. At the center of the tank there is a glass sight glass marked off in gallons. The Caterpillar C-18'S are rated at 1,150 HP each and have 800 hourson them. The engines sit on composite stringers made from Carbon Fiber. The CAT Engines have the Advantage Warranty That is transferable to the new owner. The ZF Transmissions connect to the fluid filled shaft system through an intermediate shaft with two sets of U joints, increasing efficiency and eliminating any on going alignment issues. This system also eliminates the need for a conventional salt water cooled shaft seal, eliminating any salt water from drive line. The shaft is fully enclosed in a tube full of synthetic lubrication oil. This system also replaces the conventional cutlass bearing with ball bearings for smooth operation for many years. The 17 KW Onan Generators have 600 hours on them. They are outboard of the engines. The generators are sized to run all the systems on the boat. On the aft wall there is a 3.5KW Outback inverter. The inverter will run all the refrigeration and many other systems for the day, eliminating the need to run the generator all the time. To Starboard you will find two large Marine Air Chillers. The Chilled water AC system is much more robust than conventional DX systems and offers complete redundancy. The yacht is set up to use 2 50A shore power cords when you are running the Air Conditioning. In good weather when you do not need Air Conditioning one cord will run the boat. This yacht has 2 glendining cablemasters at the Bow and 2 at the stern providing great flexibility. The yacht has a 3,500W inverter system that is hooked up to 4 large house batteries that will run the refrigeration and deck outlets when you do not have dock power or a generator running. You will find that this yacht is simple to use and the electrical system is intuitive and easy to understand. It is always a nice day in the Command Bridge. This is also a great place to live in while not underway. The large seating and table provide the best views. The twin Stidd helm chairs are very comfortable. The Garmin Electronics package is complete with dual 15" screens, 4kw open array radar and a backup 4 KW radar, sounder module and camera system. TheCAT electronic display is immediately forward of the large Teak and Ebony wheel. All the yachts systems can be monitored by viewing the indicators above the helm area. You can monitor the status of all tanks, battery banks, and warning devices. There is a very nice Day head in the port aft corner of the Command Bridge. The combination of the enclosed climate controlled helm, drink fridge and day head make this the perfect yacht for those that want to really travel. You wont need to go downstairs at all on a long trip. When you go out the back door of the Command Bridge you will find a large table and bench seat. This is the perfect spot on a nice evening. With the grill a few steps away this is a good spot for and evening meal. On the aft wall of the Command Bridge there is a row of large storage cabinets. This is the perfect place for storing covers and life jackets. Even if you are not sure you want crew, you will find the spacious crew cabin provides great storage and on those family gatherings no one will feel slighted staying in this space. You may find with the great range of the Marlow Explorer you will want to venture offshore for days at a time and taking on some help is a very nice option. The Crew Cabin has its own entrance so they do not need to come into the salon to get to their quarters. There is an oversize berth, head and shower, TV, ample storage, and a refrigerator and microwave.